Weaver and textile artist, Kayla Powers, comes to us from Detroit, MI for this 3-day Natural Dye + Weaving intensive! Kayla brings a unique approach to weaving, creating gorgeous textiles with a story. Relying on local plants for color, Kayla’s woven blankets and pillows reflect the color of place and season. 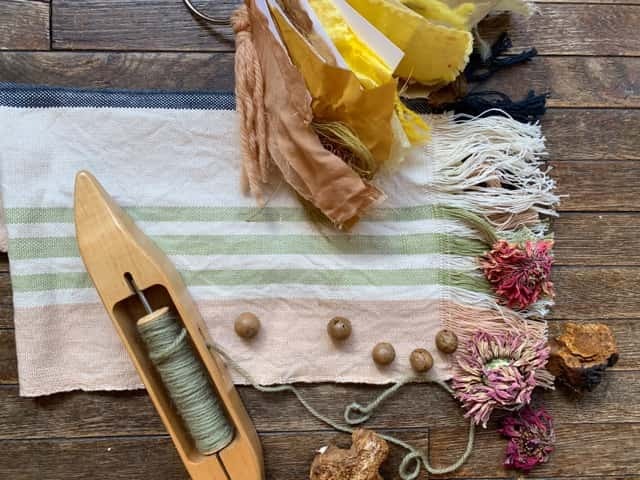 In this 3-day workshop, students will be guided, start to finish, in creating a plant-dyed, hand-woven textile. The first day will be spent learning about botanical color, processing roots, flowers and berries for dye, mordanting and dyeing fiber, as well as warping a table-top rigid heddle loom. The next two days will be spent weaving with our naturally dyed materials, learning different techniques on the loom and exploring texture, pattern and design. Students will leave with the knowledge and skills to work with plant dyes at home as well as a finished weaving. No experience in weaving or dying necessary! Loom and materials provided.